Villa With Private Pool Front Row Golf Course. Views Of Arcos De La Frontera. 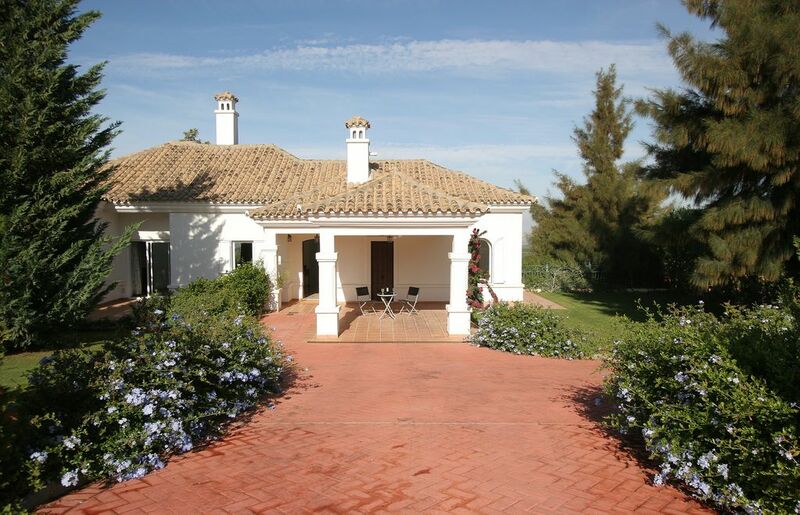 Stunning villa suitable for up to 6 people situated in Arcos Gardens, a championship golf course 5 minutes drive from Arcos de la Frontera, one of the white villages of Andalucia. Arcos Gardens,a gated community,situated in an old olive grove, offers an onsite restaurant and bar, spa treatments, gymnasium and tennis court. The villa with a large partly covered terrace and a 8x4 pool is overlooking the 12th fairway and offers breathtaking views of Arcos de la Frontera. All rooms are located on one floor. We fell in love with this part of Spain in order to escape the winters in Germany and to enjoy the peaceful area that is not yet discovered by too many tourists. Large open plan lounge with sofa, chairs , and coffee tables. Satellite TV with many international channels (including English, German Dutch and US), with direct access to the partly covered terrace. Dining area with extendible table and 8 chairs. Lovely villa in a wonderful, quiet private estate. Beautiful views across to Arcos with some gorgeous sunsets. The villa is very well furnished and comfortable, with everything you could need, and the pool is lovely. We (family with 3 kids) would happily have stayed much longer. Our week flew by - we had a fabulous time here. House is large, clean and well equiped. Pool is small, but affords lovely views across the golf course and hills. Arcos is well situated for day trips to Sevilla, Ronda, Gibraltar etc. The town itself is most attractive. Abraham was very responsive and helpful - thank you for all your help. Highly recommended rental property for a relaxing holiday. We have visited Arcos ,many times but this time opted for a villa rental rather than a hotel to provide a little more space. We were so lucky to find this exceptional villa located on a golf complex within three miles of Arcos. The views of the course were fabulous, and the entire villa beautifully kept and just as described. Beds were really comfortable and the kitchen well equipped with everything you need for BBQ or more adventurous cooking. Sharp knives were a real treat to find! The golf complex was quiet but impeccably maintained and the birdsong a lovely way to wake up in the morning.The cortijo on site served excellent food and the staff could not have been more welcoming. We would absolutely recommend this villa to anyone looking for a base within an hour and a bit of Seville or 30 minutes or so from Jerez. If you can tear yourself away from the pool, Arcos is beautiful and the trip to Ronda and Grazalema well worth it. thank you very much for your wonderful review . We are very happy that you had a good stay and enjoyed your holidays . My husband and I always stay a few days before our first guests arrive in order to make sure the villa is equipped with everything necessary ( and to enjoy a few relaxing days ). Abraham checks after all guests in case something is missing and we are glad you found everything you needed. Thank you so much for your great review. We are glad you enjoyed your stay and hope to see you back some time . Spent 2 very relaxing weeks in this beautiful villa. Communications with the owners & their agent in Spain was swift & reliable, a pleasant change in this day & age. thank you very much for your great review . We are glad that you spent 2 relaxing weeks in our villa and that Abraham did take good care of you. The property is excellent. There are three good sized bathrooms each with their own bathroom facilities and access to the outside via patio doors. The grounds are exemplary and the pool in fabulous condition. The owners are responsive to email and the payment and deposit arrangements worked well. Abraham is close by to help with any issues and indeed came to fix a malfunctioning toilet whilst we were there. He is helpful and pleasant and accommodating.The location is quiet and peaceful and about a 5 minute drive into Arcos. The restaurant on site is pleasant and the food was good. It is about a 15 minute walk through the golf course. Cannot recommend highly enough. Car needed. Closest airport Jerez de la Frontera 20 minutes , Sevilla about 1 hour 15 minutes drive .